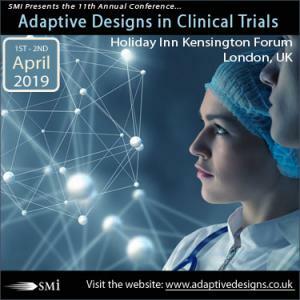 LONDON, UNITED KINGDOM, February 11, 2019 /EINPresswire.com/ — SMi Group are proud to announce the 11th annual Adaptive Designs in Clinical Trials conference and exhibition, taking place on 1st-2nd April 2019 in London. With the growing popularity in use and acceptance of adaptive designs in clinical trials – demonstrated most recently with the new FDA draft guidance on adaptive designs – there is a pressing need for a forum which explores this increasingly normalized medical methodology. In an interesting article from OncLive, Subha Madhavan, PhD, Chief Data Scientist at Georgetown University Medical Center, discussed the role of data science and informatics in bringing novel clinical study designs to the field of oncology. For this reason, SMi Group are delighted to host the two-day conference, covering how personalized medicine, platform trials, response-adaptive randomization, signature designs, estimand framework, bayesian methods and digital innovation are revolutionizing the drug development process both in Europe and North America. Adaptive Designs in Clinical Trials 2019 will bring in voices from the industry's best clinical specialists, strategists and statisticians with an agenda highlighting the latest advances to enhance the precision, efficiency and ethical aspects of clinical trials.